The attribution to the palace workshops here is supported by a number of factors. The bottle is hollowed through a wide mouth and the hollowing stops near the base, leaving a heavy foot (visible as a slight change in colour in the illustration), both features associated with Imperial production from the palace workshops. 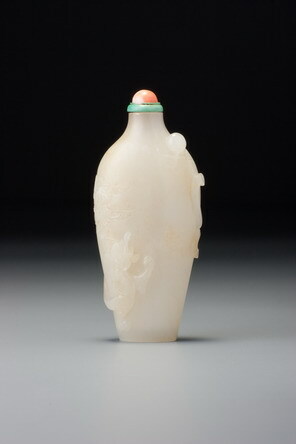 It is also from a range of undistinguished-looking nephrite which was obviously favoured by the Qianlong emperor, along with other more inherently valuable materials. 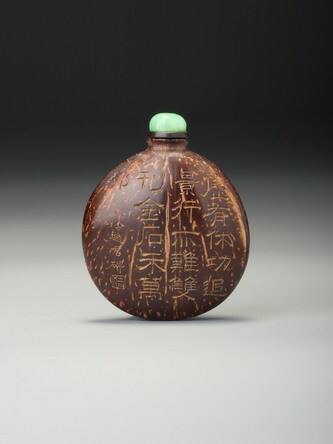 The relatively dull material of this bottle, which without the carving would create little excitement, is a lesson in art: it is not the material used that makes art, but what is done with the material. Certainly a brilliant yellow or pure white material would make the same carving more valuable, but it would not improve it as sculpture, and therefore as art. The sculptural appeal of this bottle is impressive. The sensual curve of the profile is ideally matched by the placing of the beast and the pearl, the latter particularly taking on an extraordinary jewel-like quality by being almost entirely in the round and sitting sufficiently close to the neck that, viewed straight-on, it rises above the profile of the shoulders to offset the body of the dragon at the opposite, lower corner. It is also, despite the high relief of the pearl, an extremely comfortable bottle to hold in the hand, with the thumb naturally falling upon the pearl, allowing its smooth roundness to be fondled like a real pearl.